I hope you’ve got off to a great start with your 2014 diet and fitness goals (of course that’s assuming you had some!). What actually constitutes a healthy diet can seem a bit of a minefield with plenty of contradicting advice and conflicting studies telling us that something is both good and bad for us. One of the many diet related health risks we keep hearing about is type 2 diabetes. The statistics show that the modern diet is putting both children and adults at a much greater risk of developing diabetes than in previous generations. In Britain alone there are more than 3 million sufferers. With this is mind it would be good to know if there are any foods that can help ward off diabetes. A team of researchers at Harvard University recently addressed this very question. They looked at three large studies which gathered data on 187,000 US nurses over a 12 year period. They were asked about their eating habits every 4 years and 6.5 percent of them developed diabetes over the course of the study. The analysis of the studies threw up some very interesting results on the health giving power of consuming fresh whole fruit. 1) Blueberries – had a 26% lower chance of developing diabetes. Even more enlightening and very much consistent with the recent health warning on increased sugar consumption in our diet, regularly drinking 3 servings of fruit juice a week actually increased the risk of diabetes by 8 per cent. So what useful tips can you take from this. Basically I would recommend that you avoid fruit juice and eat whole fruits if you want to reduce your diabetes risk. For example replacing three servings a week of fruit juice with three servings of blackberries would cut your risk of developing diabetes by 34%. Not a bad trade I think you’d agree! Dinner – Footlong veggie sub – again no mayonnaise or cheese. You probably know the rest of the story. His Subway diet, along with exercise, got Jared to drop over 200 pounds. He then became a spokesperson for Subway, sharing his story and inspiring millions of people. And suddenly Subway became synonymous with healthy eating. Have you looked at a Subway napkin? It lists 7 of their lighter sandwiches. Then at the bottom it compares these sandwiches to the Big Mac and the Whopper, burgers that hold 31 and 40 grams of fat, respectively. The Subway meal is much healthier, right? Well, yes and no. Go back to your napkin and read the small print. The 7 sandwiches listed are calculated with only bread, veggies and meat. So if you add cheese, mayonnaise, or oil (as most people do) then you need to recalculate the numbers. I’ve done the maths for you, with a 6″ Roasted Chicken Breast sandwich. Wow, just like that your ‘healthy’ Subway meal has 1,200 calories and 65 grams of fat! Sure, you probably don’t get all of the extras when you eat at Subway but that’s not the point. The point that I’d like you to take away from this is that you shouldn’t classify any restaurant as ‘healthy’. You could gain weight eating anywhere, just like you could lose weight eating anywhere. Jared’s weight loss happened when he drastically cut calories and started to exercise. He could have done this at any restaurant. In fact, last year a woman from Virginia claimed to have lost 75 pounds by eating exclusively at Starbucks. Your weight loss success all comes down to choices. Each day you make choices that directly influence your weight. Do you get mayonnaise on your sandwich? Will one cookie hurt? Will one missed workout really make a difference? You decide. At some point you reach your breaking point. For Jared it was 425 pounds. For you it might be when you buy the next size up. Or when you feel new aches and pains. Or when your doctor sits you down to have the talk. I know that sooner or later you will decide that you are worth it. You’ll decide that your health is important. You’ll decide that you deserve to look great. And you’ll dig down deep to do what it takes to achieve amazing results. I’m here to help you when you’re ready. Call or email today to get started on a fitness plan that will change your body and your life…just like Jared. 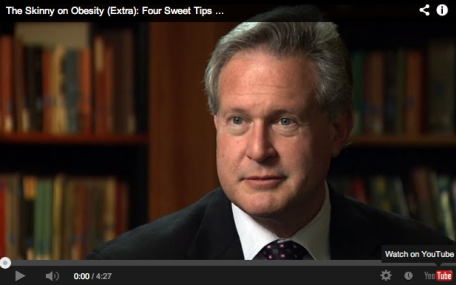 Staying on the subject of childhood obesity from my previous post there is a great video online by Dr Robert Lustig – Pediatric Endocrinologist at the University of California, San Francisco. In the video “The skinny on obesity” Dr. Lustig offers four excellent and useful tips to help you and your kids steer clear of excess sugar and overeating. Even if you don’t have kids, these healthy tips are for you too. Get rid of every sugar beverage in your house including fruit juice. There is no such thing as a good sugar beverage. Encourage your child to drink water when at home. Eat fibre rich carbohydrates to slow digestion and absorption thereby keeping insulin levels down. Wait 20 mins before allowing second portions. This is the time it takes for the brain to get the satiety signal. Buy your screen time with activity. If you are outside for an 30 minutes you can have 30 minutes of TV. If you ride your bike for an hour you get an hour of facebook time. No activity no screen time. Here’s the words from the man himself…. With the birth of my first child only 3 months away I am almost beside myself with excitement and of course not a little apprehension. The responsibility of being a father and parent is certain to be the most wonderful but challenging journey of my life. Working in the fitness industry gives me an extra awareness of the impact of poor role models, bad diet and lack of exercise on the weight and health of our young children. A recently published national report stated there has been a four-fold increase in the number of children and teenagers admitted to hospital for obesity-related conditions in the last decade, with rates of obesity surgery also increasing, especially amongst teenage girls. Doctors say the UK has the highest rate of child obesity in Western Europe. Childhood obesity has been linked with serious illnesses during childhood and an increased risk of developing conditions, such as type-2 diabetes, asthma and breathing difficulties during sleep. Furthermore national surveys in England suggest about 3 in 10, two-to-fifteen year-olds are overweight, while 14-20% are obese. The upshot is we have a very serious problem that presents a huge child health risk and a massive burden on our health service. I recently had an enquiry from a concerned parent looking for personal training for their overweight son of only 11 years (which I politely turned down as I am not an expert in pre-adolescent fitness). Now whatever your thoughts are on the rights and wrongs of personal training for children (not discounting the expense!) there is definitely something amiss in the education and advice being given to many children about how best to be healthy. So returning to my forthcoming fatherhood I feel a strong sense of responsibility to give my baby the healthiest diet possible. Obviously initially that will be out of my hands until solid food comes into play but what then? The plan is to research the healthiest, whole food derived organic baby food in the market that doesn’t contain nasty food additives, flavourings and nutrient empty sugars or sugar alternatives such as high fructose corn syrup – that’s assuming such a thing exists. The main thing is to try and avoid giving my child an early sweet tooth so nutritious food doesn’t taste bland in comparison. Within a few months of starting solid foods I’ll try and encourage a daily diet that includes a variety of whole foods each day such as meats, whole grains, vegetables (avoiding nitrates), fruits, eggs and fish. Generally, meats and vegetables contain more nutrients per serving than fruits or whole grains so more of the former would be preferable. Of course this will all depend on my little one’s taste buds and inclination. I am sure my best intentions will go out the window the day I discover the only foods that will stop my baby crying are chocolate and Ice cream. But until that day I’m staying steadfastly optimistic! This week I want to talk about how to resist sugar cravings, and more specifically share two very different recent personal experiences. I was driving to a client with no time to spare and I had an unbelievable urge to eat some chocolate. It was so strong that I couldn’t ignore it and did something I never ever do and pulled in at a corner shop and bought a Snickers Duo Bar. Now for me this was a seismic event as I never buy chocolate and I haven’t bought a Snickers bar in well over 5 years (and that’s the honest truth). But boy did I love every one of the 511 calories in that chocolate bar. It was utter heaven. So what the blazes happened you may ask (as I did) well I can only assume that it was my body crying out for energy after a week of limited calories. It made me desire the most energy dense food it could make me think of. With the benefit of hindsight I can now see that the intense craving was for my own health. At the time I didn’t think at all, I just reacted. This leads me on to my second craving experience a few weeks later. My wife, Ali and I decided as a treat to bake a delicious coffee and walnut cake to enjoy after a long weekend walk. The plan was to have a slice with a cup of tea and the following day to gift the rest of the cake to my wife’s parents. Part one of our plan went very smoothly, as you can imagine. However the next morning in a rush to get off on time we forgot the cake and it was left sitting on the kitchen worktop as we drove off to Derbyshire! Now I consider myself to be very self disciplined when it comes to my diet and I try and practice what I preach. That means no biscuits, cakes, puddings or sweets for at least 5 days out of 7 each week. However my main weapon is never to allow temptation in the house. I am lucky in this respect as Ali supports me most of the way and we don’t have kids to buy it for. Anyway back to the damn cake…now more than happy to sit on the worktop under cling film taunting me with thoughts of “go on, you know you want a piece”. But I resisted and managed to hold off for a whole day thinking “I can beat this”. Wrong! The next day I came back from a run in the freezing cold and couldn’t resist tucking into a large slice with a cup of tea. Afterwards feeling a little disappointed with myself, I consoled myself with the fact that I had burnt some calories on the run and that maybe it could be classed as a score draw. However worse was to come the next day when I came home for lunch, between clients, and ate a very healthy tuna salad. This would normally suffice but yet again the cake won, and whilst making a cup of tea I made the mistake of looking at it and before I knew it I had popped a substantial slice on my plate! 1) Food Cravings however they occur can be incredibly hard to resist. The urge almost possesses you and throws all rational thoughts out the window. And that’s even if you are normally a rock of self-control like me. 3) Some cravings are nothing to do with your body’s nutrient requirements and more to do with boredom, mood, and dare I say it gluttony. So these are the cravings you should fight, the problem is that any clarity of thinking usually comes in hindsight when it’s all too late. I’m no expert (as you can see!) but personally I think the best way to resist sugar cravings is to remove temptation i.e. do not have them in the house in the first place. If you have a stash I would throw them in the bin or give them away. If you can’t bring yourself to chuck them, or you have kids, then make sure you put them out of site and preferably in a place that requires an effort to get to. This could be a locked cupboard or a high shelf that requires a chair to reach. This should at least make you consciously think about what you are doing before you do it. If treats can be grabbed quickly it can almost be a sub-conscious, automatic response just to grab a handful and stuff them into your mouth. So in summary you need to bring the craving into your consciousness and analyse it before acting or not acting upon it. How much sugar is in your fizzy drink? This week I want to talk about fizzy drinks and why you should definitely avoid them if you care about your health. This is a serious amount of sugar and calories to consume in one, easy serving. Even if you’re partial to a little sugar in your cup of tea, I’ve yet to meet a tradesman who puts nearly 10 teaspoons of sugar in their cuppa! With an ever increasing number of type 2 diabetics being diagnosed amongst adults and scarily now children as well, cutting your sugar intake is a very sensible strategy. So if you want to stay slim and healthy then I would strongly advise that you do yourself a favour and stick to water, milk, tea or coffee. This week I want to talk about the new diet craze called Intermittent Fasting. If you haven’t heard about it, then one can only assume that you’ve been locked away in a safe house for the last 6 months! All the fuss started when BBC2 aired a Horizon documentary in August last year which followed the doctor and broadcaster Michael Mosley on an intermittent fasting diet for 6 weeks – where he lost a stone, dropped his body fat by 25%, improved his cholesterol and reduced his blood glucose readings (from a borderline pre-diabetic position). This was pretty impressive stuff and it was backed up by research in America which had demonstrated equally impressive results over a number of trials. The subsequent interest was so phenomenal that Michael Mosley has just published a book on it called the ‘Fast Diet’, that has been flying off the shelves. Is it just another fad diet? Many diets have their time in the sun only as a result of desperate people making desperate choices to lose weight quickly. Most of these diets do help you lose weight but it’s mainly due to calorie restriction and malnourishment which only works until you start eating normal size meals again. The net result being you pile all the weight back on and usually more due to a metabolism that has slowed down to a snails pace from constant starvation. The difference with the intermittent fasting approach is that it appears to be grounded in good science and is a diet that you could actually embrace as an ongoing lifestyle choice as opposed to the normal 6 week hellathon that you can’t wait to finish. The most popular version of the diet is termed the 5:2 approach which requires a normal eating approach (I’ll come back to this) for 5 days a week, interspersed with 2 non-consecutive ‘fasting days’ of 600 calories a day for men and 500 calories for women. The theory being that during the 24hr fasting days the body burns all of your body’s stored energy in the muscles and liver and then has to start burning your fat stores for energy – bingo you lose fat! However the genius in this approach is that the very next day you eat normally so your body has no need to fall into full ‘starvation mode’ where it slows everything down to conserve vital energy. This ensures your normal metabolic rate is maintained, one of the key factors in achieving fat loss and keeping it off. Is it easy to do 2 fasting days a week? In one word.. no! Trying to survive on 75% or less of your habitual daily calories is certainly a challenge for most. However much of the research suggests that once people have managed their first ‘fast’ day successfully, subsequent fast days appear to be easier both mentally and physically to successfully complete. It must also be said that managing just 2 days a week, however extreme, will for many be significantly easier that managing 5,6 or 7 days on a fad diet. Like anything this type of diet will appeal more to some than others, but the excellent results it can give are very persuasive. What about the other 5 days? Now in my opinion here’s the rub… just because you’ve been good for 2 days a week doesn’t give you free licence to eat whatever you want on the other 5 days. Eating copious amounts of processed and high sugar foods will undoubtedly negatively impact a lot of the health and fat loss benefits derived from the fasting days. To ensure against this I would recommend a ‘clean’ real food diet for the 5 non-fasting days. For more details of what this entails take a look at ‘The Real Food Challenge’ below. To sum up, I do believe there are a lot of health and weight loss benefits in following an intermittent fasting diet, but not in isolation. It needs to be layered onto a healthy ‘real food’ lifestyle and if used this way can be a very useful strategy for weight management and improved health. Have a good, healthy week!